In mid-1944, Douglas started work on an attack aircraft that was initially dubbed "Dauntless II". The AD was designed as a next-generation dive-bomber and torpedo aircraft with greater range and payload capabilities over currently fielded aircraft. The AD entered production side-by-side with the AM Mauler. The war ended before either could enter operational status, and production of the Mauler ceased after 171 examples were built. The Skyraider remained in production until 1957 with over 3200 aircraft produced. Each version of the aircraft incorporated improved engine, avionics, and payload capabilities. The AD-5 was the most unique of the versions in that it had a different fuselage that turned the single-seat attack aircraft into a multi-place, multi-mission platform. In 1963, the US standardized the aircraft nomenclature across the services and the AD Skyraider became the A-1 Skyraider. 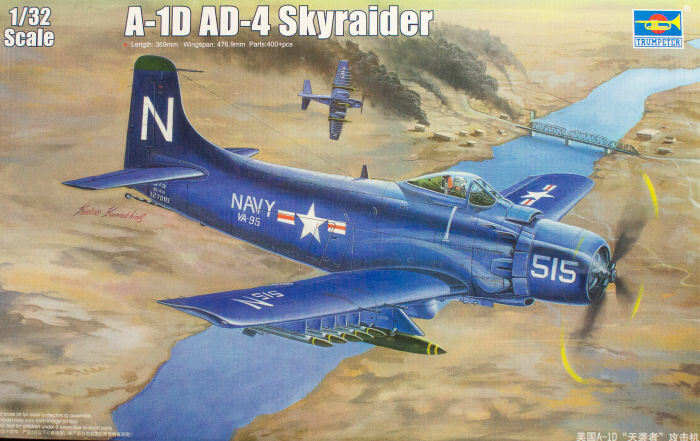 The Skyraider had its baptism of fire over Korea with the AD-3 and AD-4 equipping US Navy and USMC attack squadrons. The aircraft could remain aloft for 10 hours and carry a significant payload, unlike the early jets of the day. Radar-equipped AD-3N and AD-4N variants were able to operate at night and deliver their weapons on target, providing UN forces with the capability for round-the-clock air operations. I remember when Trumpeter first announced the 1/32 scale A-1 Skyraider series in 1/32 scale many years ago, long enough for another company to design and produce two variants also in 1/32. Well the wait is over and how does this kit look? Let's see. While Trumpeter has announced a number of A-1 variants coming in the future, at this moment in time, we Spad lovers have three distinctive ADs to choose from, this AD-4 in Korean War service and the Zoukei Mura AD-6 and AD-7 in Vietnam War service. Both kits provide since nice details straight out of the box, but this kit provides far more external stores options for a lower retail price (with street prices even lower). It is nice to see this ultimate tail-dragger attack machine properly represented in 1/32 scale and from what I can see, Trumpeter's done a really nice job on this kit. 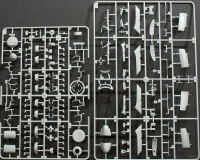 Since this tooling is now being released in 1/32 scale, it really won't be that much longer before we have some new-tool Spads also available in 1/48 and 1/72 scales in our future given the prolific nature of Trumpeter and its sister company HobbyBoss.